Human Survival Depends Largely on Wildlife Existence, Know Why? Are you glad that we are talking about this on a Travel Site? Well, as a traveller who hopes to see the charismatic world, you should be happy that we raised this issue. Here’s how this issue cropped in the teeny-weeny brain of mine (yeah, even girls think! ), I was writing a blog on Corbett National Park and I needed to check the species of flora and fauna found in this oldest reserve in India, I marveled at the digits that I saw and then BAM! The thought just hit me that why do we have the need of preserving the wildlife? I mean we are setting protected boundaries for what was once unbridled! Categorizing wildlife species into endangered, threatened and lower at risk headers, voicing against poaching and promoting organic clothing…AND questions remain why are we doing all this? Why is there a need for conservation and why are there so many wildlife reserves? More importantly are we becoming conscious or are we getting insecure? Godly God is how I like to address him who created the wise food chain that significantly keeps everything in place. The lion eats deer; the deer eats plants and plants with the help of the sunlight generate oxygen. If one part of the food chain is disturbed the entire chain is deteriorated in terms of existence as well. Let me give you an example on the surface algae, this not so good-looking item is the food and energy source to many aquatic animals like fish, frogs and insects but what if the aquatic animals decides not to eat algae? Well not only these aquatic animals lose their vital source of energy but also the algae now growing unchecked will suffocate itself (as the sunlight will not reach it) and eventually die. Another turn to the tragedy would be that while the algae was growing unbridled, it prevented the sun to reach the water and thus affected the sustainability of inhabiting fishes and other water animals… LOSS to a vital part of ecosystem! And we eventually know that the loss to ecosystem is the loss to human race. Adam and Eve were cast out from God-created Eden Garden, but before He punished those two sinners, he made them wear the clothes made out of leaves. So what, if we don’t wear the same type of clothes anymore… Jute fiber, cotton, hemp and couple of other raw materials that are used for making everything that you own in your wardrobe comes from plants that are apparently part of wildlife! The irony is once animal skin and fur saved the human race against the cold climate, today human have to save animals against the climate and other dangers caused by human race. From the clay houses in the rustic setting to that grand villa with multi-leveled swimming pool and terrace garden, wherever you are sleeping at has been built piece by piece from the materials found in wildlife. The wood, the bricks, the clay all of these are the gift of nature to you without it you could be homeless…Think about that! Say thank you to the plants and trees that grows around you without being taken care of. Yes, we all learnt it in school about process of photosynthesis and how it produces oxygen. Required by all living beings, oxygen is the best gift from wildlife that one can receive. Similarly, if we speak about phytoplanktons that are microscopic plants that live in watery environment; these plants help in eliminating carbon from the atmosphere and maintaining the amount of dissolved oxygen level in the water. So, it wouldn’t be incorrect if I say that you owe a big thank you for your survival on the planet to lovely plants and trees that are essential part of wildlife. Since, we live in India, where Ayurveda is the key identity of the country; all of us fairly know the worth of medicinal herbs. This age old science is not only the part of our culture; its worth has been proved worldwide. Let me give you an example, according to FDA, Reishi and Turkeytail mushrooms can be of good use in cancer treatment. These varieties of mushrooms not only help in fighting against the lethal disease but to overcome it as well. Similarly, there are many other plants/herbs that have been helpful in curing and treating many chronic diseases. Animals have also been a boon to human, there was a time when insulin could not be produced artificially; during that time it was extracted from horses. If it wouldn’t be for horses, many would have died without the insulin. Let’s face it; our abundance is dependent upon wildlife as well. Have you heard of Nematodes? (Well, I also have heard about it for the first time). These are microscopic worms that help in the growth of the plant. Composting in the soil, they convert into high value nutrients for the plants, helping them grow healthy and in abundance. Nonetheless, there are few species of Nematodes that can be called parasites, as they feed upon unwanted pests that damage the crop growth significantly. If it wouldn’t be for Nematodes, we would have very less vegetation and WE know the consequences…Vegetarians worldwide might have gone hungry! – While you go TREKKING, do not litter. Try and keep the natural surroundings clean. – Try to be an ethical consumer, if you think that something in the market is manufactured of illegal item, DO NOT buy it. – Instead of driving in your personal car while going to any destination, use PUBLIC conveyance. – Smoking is actually INJURIOUS, not only for you but for the environment as well. If you are heavy smoker, try and limit the number of cigarettes that you consume in a day while travelling. 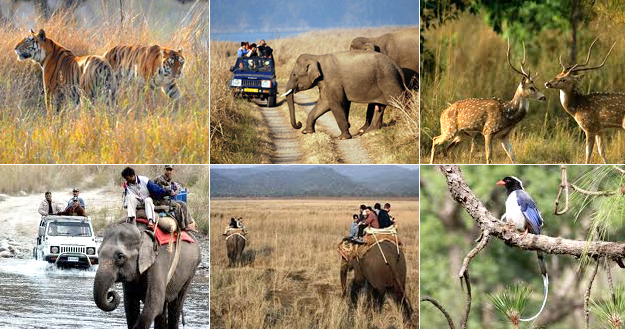 – Social media is powerful weapon, after your trip to national park or hill station, SHARE pictures/blogs on social media platforms, that ways you promote wildlife tourism: the more people visit, the more efforts will be made to maintain the wildlife by the authority.